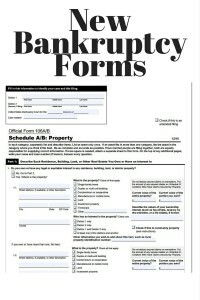 On December 1, 2015, almost all of the bankruptcy forms and schedules were amended. Many clients who had already signed earlier versions of the forms and were awaiting filing, had their filings delayed because they had to re-sign and reread new forms. In certain circumstances, the forms had to be emailed or faxed to expedite an emergency filing. Now as we come to the conclusion of several cases, the official form 423 regarding certification about a financial management course has to be newly signed as well. The court granted a 30 day grace period after the forms were changed to utilize the earlier version of forms. Since we have now exceeded the 30 day grace period, there are many clients who have to re-sign form 423 in order to file the financial management certification and receive a discharge. Although this may not seem like a big deal, I have a current client who is making the transition to the new form quite difficult. Not every client is technologically savvy. This particular client was unaware of how to fax a document to the office. Thus, we will be using regular mail to circulate the document. I will have to keep a close eye on this file to ensure that the official form 423 is returned to me. If not, the debtor’s case will close without a discharge and there will be a huge fee to reopen the case to have a discharge entered. with what documents are required to be signed and that they will provide those signed documents to my office as soon as possible. There is also an effort underway in the Northern District of Illinois to revise the local rules with regard to bankruptcy cases. We have just recently seen a judge deny fees because the court approved model retention agreement was not attached to the fee application. Prior to this judge’s rejection of the fee award, there was only one judge prior who was requiring that the court approved retention agreement be attached. As a precaution, I am now attaching the court approved model retention agreement to all the applications whether or not the specific judge requires it or not. It seems that judges will look to find any reason to deny fees for debtors’ counsel. The same rules do not apply to creditors’ counsel nor do they apply to the high priced, chapter 11 corporate bankruptcy attorneys that practice with regularity in front of the same judges. If anything, the corporate counsel should be held to at least the same standard as the consumer bankruptcy counsel. However, it appears that the judges are not as lenient with debtors’ counsel when it comes to the applications and their efforts to get compensated for the work that they provide to their clients. Lastly, the new bankruptcy forms are making it more difficult for debtors to review the documents and for debtors counsel to review the documents as well. With each schedule being changed, there is no significant consistency from earlier versions of the forms. Thus, debtors counsel must scrutinize the documents to make sure that all the information entered into the software is provided for in the petition in the proper format and in the proper place. As for debtors, to read and review the documents has added a significant amount of time and a significant amount of sophistication that was not required. As with anything that changes, there is a learning curve and a period of uncomfortableness. Let’s hope that this major change to the bankruptcy forms becomes more palatable over time.